Seven specialty grades and three tubing colors of Indow windows are available. Indow window inserts are interior storm windows that press inside window frames. 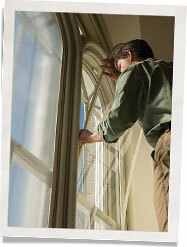 Window insulation & noise reduction at lower cost than replacement windows. Seven specialty grades and three tubing colors are available. All grades provide the same draft blocking and noise reducing window benefits. There is no visual difference between their Standard, Acoustic, Commercial and Museum grades. Standard Grade – Standard grade Indow inserts offer a great balance of comfort, energy efficiency, and noise reduction at our entry level price. The inserts are made out of acrylic glazing and edged with their patented Compression Tube. The tubing compresses when pressed inside your window, holding the insert securely in place while sealing out cold drafts and hot air. Indow Windows are like inside storm windows, but easier to use and non-damaging to your window frames. You can easily pop your Indow Windows out whenever you want to catch a fresh breeze. Their inserts can be customized to just about any shape – rounds, arches, octagons, batwings, odd angles, rounded corners or frames with multiple angles. Stock colors (shown at right) are brown, warm white and black. Pantone full color range is available for large commercial orders. Acoustic Grade – Want to block the noisy outside world? Acoustic Grade reduces noise coming through operable single pane windows by 18.9 dBA, according to the Green Building Research Lab. An 18.9 dBA reduction feels subjectively, like a 72 – 75% reduction in noise. Available in all types except Sleep Panels and Museum & Shade Grade. In addition to window noise reduction, Indow window inserts also provide excellent thermal insulation and save you money on utility bills. To learn more about the thermal and energy saving benefits please read about our performance metrics. Shade Grade – Shade Grade Indow window inserts shield searing summer sun from coming through your windows to keep you cooler and more comfortable. By reducing solar heat gain, Shade Grade window inserts boost home comfort and energy efficiency. Simply press inside your window frames to cool down your house and give that air conditioner a break. Sunlight through a home’s windows can dramatically spike temperatures. Shade Grade inserts have a soft green tint and still let in plenty of light while reducing solar heat through your windows by almost 50%. Enjoy bright summer light without sweltering heat. Like all Indow window inserts, Shade Grade inserts are custom-fit using our laser-measuring system and have an airtight seal. This can dramatically reduce outside noise by up to 50% when placed over single-pane windows. Sleep Panels – Indow Sleep Panels create darkness, quiet, and comfort for night-shift workers, paleo lifestyle followers, and home theater enthusiasts. No other solution blocks 100% of light and more than 50% of noise. Sleep isn’t a luxury. It’s essential to your health and well-being. Your creativity soars and you make fewer mistakes when you’re well rested. Blackout windows give you the quiet, dark environment that is often crucial to making sure you get that good sleep you need. If you need blackout windows, Indow Sleep panels are an elegant solution that provides more darkness and sound dampening than any alternative. Indow Sleep Panels block 100% of the light and more than 50% of the noise coming through your windows. Night-shift workers, those who live a Paleo lifestyle, parents of young children and others seeking undisturbed sleep can finally get it. People desperate for sound sleep have tried everything to create blackout windows: blinds, blackout curtains and drapes, all of which still let in light and require mounting and track systems. Some have even tacked heavy blankets over their windows! Indow’s Sleep Panels are so simple: they just press into place with the patented Compression Tube and can be easily removed to let in natural light. No blackout curtain blocks 100% of light: Indow Sleep Panels do. “No light gets through them at all,” said Brad of Portland, OR. His wife, Lauren, is a night-shift nurse and they had Sleep Panels installed to improve her sleep during the day. But the panels also block street lights and city noises that bothered Brad at night. “It’s like sleeping in a soundproof box,” he said. Privacy Grade – Elegant window privacy; these Indow Windows are made from translucent white acrylic that allows diffused light transmission while blocking out details and defined shadows. Great for bathrooms and bedrooms. Museum Grade – Protect your furniture, carpets, and artwork by blocking 98% of all UV rays from sunlight coming through windows. There is absolutely no visual difference between the Standard and Museum Grade acrylic. Both are crystal clear. And speaking of museums, Indow Windows recently opened up greater public access at Alcatraz by shielding broken gun gallery windows at the former federal penitentiary in preparation for an exhibit by Chinese artist and dissident Ai Weiwei. Organizers chose Indow Windows because the inserts will preserve and protect this National Historic Landmark without leaving a mark. Commercial Grade – Commercial Grade gives you an extra abrasion resistant coating to provide additional protection against scratching from moving & frequent cleaning. There is absolutely no visual difference between the Standard and Commercial Grade acrylic.